I had a wonderful 8-Mile walk with some great friends this morning, followed by lunch at Off the Grid. I've missed walking with these wonderful women! 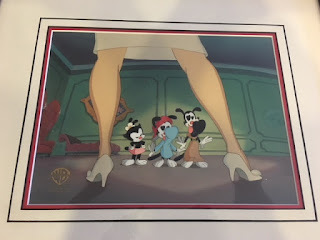 25 years ago, in 1993, a new animated series premiered on the WB network called "Animaniacs". Animation Geek that I was, I was an insta-fan (so was my Sister, my Mom, our friends, and my young cousins!)! We watched all of the episodes over and over, and had many of the episodes, songs, lines memorized. It was so witty, so smart, and in true Warner Bros./Looney Toons fashion, was just as much for adults as it was for kids. I was also just starting in art school, studying fine art as well as animation. We waited in a long line and briefly met Rob Paulsen (Yakko), Jess Harnel (Yakko) and Tess MacNeille (Dot). Not to sound like a super-fan, but it was quite a thrill. If memory serves, all three of them talked a bit to the audience, took Q & A, and then signed autographs and signed memorabilia for fans. I brought my Original Production Cel that I had bought earlier that year. It's one of my prized possessions in my animation art collection. It's an original cel of one of the first episodes of "Animaniacs" called "De-Zanitized" and it shows a classic scene of Yakko and Wakko and Dot through the legs of "Hello Nurse". 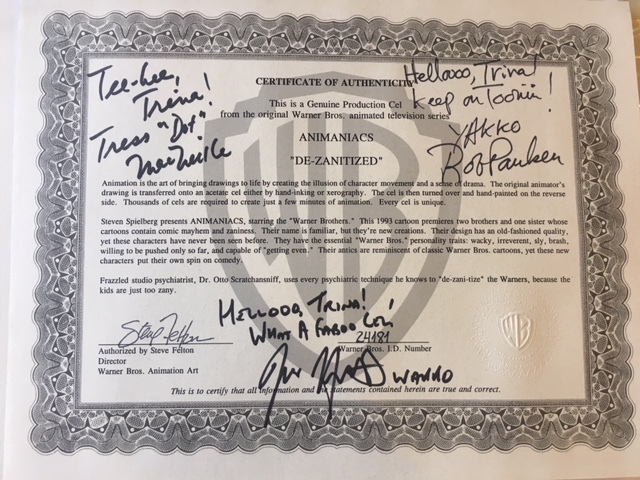 The three actors graciously signed the Certificate of Authenticity on the back of my Cel's Frame. Anyhow, last night, my Sister and her husband, Graham, got us tickets to see "Animaniacs in Concert" at the Hotel Nikko in San Francisco. (Thanks, Sis!) Rob Paulsen (Yakko, Pinky, Dr Scratch and Sniff) performed with Randy Rogel, who was the composer of all of the amazing and memorable songs from the series. The show was fantastic, and really everything that you would hope for from a performance from these two. Randy played the piano and sang the songs with Rob, and they shared stories from the series, and about the songs. It was fantastic. The venue was small and intimate. I'd guess there were fewer than 80 people in the audience. After the show, my Mom and I decided at the last minute to wait in line to talk to Rob and Randy. 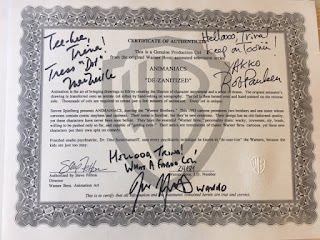 I hadn't thought to bring anything for them to autograph, but I thought it would be fun to talk with them for a quick minute, and to take photos with them, especially because we had taken a photo with Rob 25 years ago. I didn't even think to bring the photo with me at the time, but my Mom managed to find it amongst all of their photos at home today. Rob and Randy were both incredibly gracious and present with us when they talked to my Mom and me. We were near the end of the line, so I'm sure they were very tired from the performance and having talked with so many people, but I'm so grateful that they seemed genuinely happy to chat. My Mom just sent me the photo that she found from 25 years ago of us with the three voice actors. 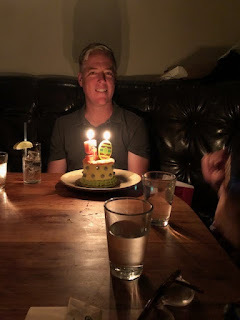 It's fun to compare it with the photos from last night. Hard to believe that it has been 25 years since we took the first photo! 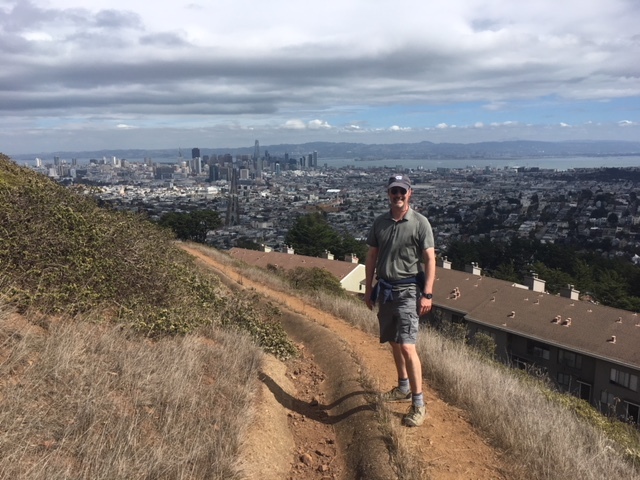 It was the perfect day for a hike: warm without being hot, and clear enough to see the amazing view. 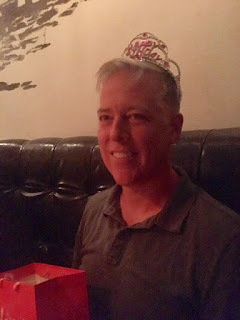 My Dad is leaving for a solo trip (with a group, but without my Mom) to India!! It's the first time he's ever traveled Internationally without my Mom, and by far, the longest they will ever be apart. I know they'll miss each other, but I'm sure he'll have a great time. I'm feeling a little bit like a super hero today. I just finished donating platelets, as I try to do at least once a month. I usually donate 2 units of platelets which usually takes between 50-60 minutes. Today, I noticed that the amount of time that the draw would take was longer by about 25 minutes. 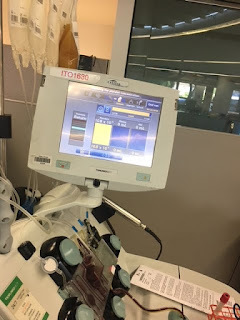 After I looked back at past donation photos, I realized that the machine was programmed to have me donate more platelets than I have in the past. Instead of donating two units of platelets, I donated 3 units today!! The system here at the blood center decides how much platelets to draw based on the readings of your last donation. Apparently, not only was my platelet count at its usual high level, but my iron level and hemoglobin was also high enough for it to plan on 3 units this time instead of 2. Considering the extra amount of platelets only took less than an extra half an hour of my time, I'm pretty happy to be able to donate so much more. 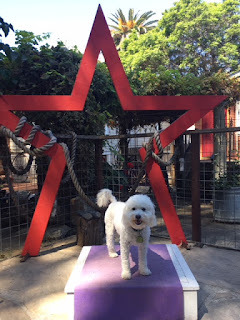 Wallace and I went our the fifth (of six) lesson of Level 2 Canine Circus School today. Today's class was especially great! We have been practicing how to balance a ball (actually a Hackey Sack) on his nose for a few weeks. Today, something clicked, and I think he understood what we were trying to do. Today, he managed to keep the ball balanced for a much longer duration than ever before!! So proud of him!! Shan and Shoko were in town for a few days from Zurich. We had breakfast with them at The Palace Hotel (where they were staying) before they flew out again this afternoon. 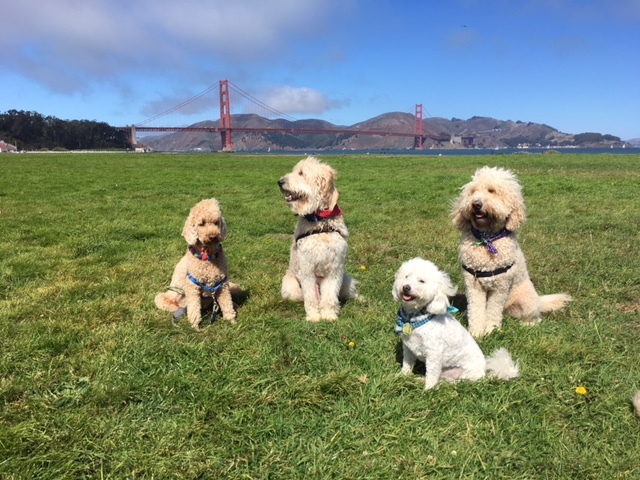 Wallace and I had a great time at a Doodle Romp with special guests this morning. 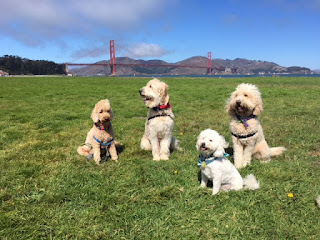 Sansa was in town visiting from New York, and Tucker and Wally were visiting from San Diego! Happy Birthday to my wonderful husband, who spent his day doing one of his favorite things: skippering a boat and sailing on the Bay! Wallace and I went to our second session of Flying DOGA- Small-dog friendly trapeze yoga today!! It was super fun! This time, Wallace got to try out laying in and relaxing in the trapeze. 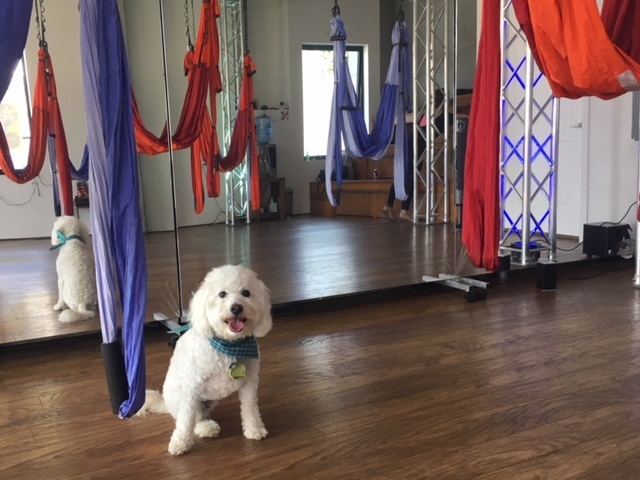 At the end of the class, all 5 dogs were laying in their trapeze while the owners all tried to get the perfect photo of them together. I'm really glad I signed us up for this again. The classes are offers once a month, so hopefully we can do another one soon. My parents are the best! Truly!! 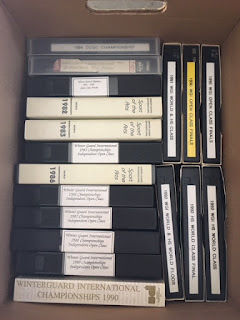 I was visiting them a couple of days ago, and asked my Mom if she still had any or all of our old VHS collection of WGI Videos. I knew I had given her my collection years ago when I was moving and purging (and had put most of them on DVD), and realized that she may have purged them before their big move more than two years ago. My Mom showed me TWO BOXES in their garage that held all of the VHS Video tapes of all of our color guard memories from the early 1980s through the mid-90s. I have a terrific collection on the standard WGI Finals for most of those years, but the collection my Mom kept is VERY special: she has Floor Tapes, WGI Prelims performances, Regional performances, and some entire CCGC Circuit Shows. She also has footage of rehearsals from when my parents used to fly out to wherever my sister and/or I were living and she would video tape our rehearsals. I always knew that my parents were especially amazing and supportive of my sister and me. Not only did they support our interests while we were growing up, but they would drive us to all of our rehearsals and shows, come to each of our local competitions, travel to our competitions that were further away, and volunteer to help with sewing uniforms and flags. Once my sister and I were older, they supported our desire to move to different parts of the country to audition for different guards (they would even drive with us across the country and back!) and they would also come to visit us while we lived states away from home, and fly to some of the regionals to cheer us on, and they would always be there for every WGI that we ever competed in. Not only did they house several of our friends who needed to live locally to Santa Clara or San Jose (even when my sister and were living in other states!, but they even housed my entire guard and staff when we flew out from Madison, WI to San Jose, CA for a regional! That was about 50 people staying overnight at my parent's house! Aside from all of that, my Mom was amazing at helping us build one of the most cohesive WGI video library around. Between the two of us, we had all the VHS tapes from 1982-1993 (and more) for most of Open/World Class. 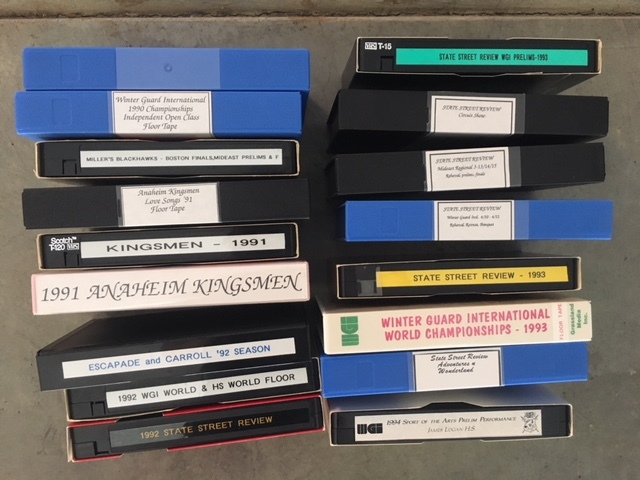 Even more impressive, we had somehow managed to acquire WGI Finals Floor Tapes for some years (Open/World and Scholastic) and even a couple of WGI Prelims tapes for a couple of years (only for the guards I was in or was teaching). And on top of everything else, my Mom is a techie - she was more techie gadgets than most people, and holds onto older machines as long as they are still working. That means that not only did she save all of our old cherished WGI video tapes, but she also has the technology to convert them from VHS to DVD!!! That's AMAZING!! So, when I was over at their house visiting last week, I sorted through all the videos and pulled out the really special ones that I know I don't already have in digital form: the floor tapes, the prelims tapes, and the all-season tapes that my Mom had put together of rehearsals, local shows, retreats, end of the year banquets, etc., Such special memories! 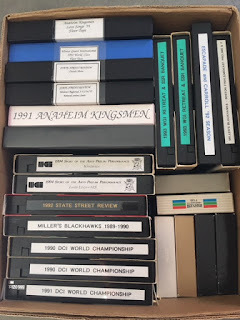 It took a little bit of doing, but my Mom was able to hook up her old VHS to DVD recorder, and we prioritized converting the shows that meant the most to me: The ones from when my Sister and I marched in Sparks and went to WGI in 1986 and 1987 (but didn't make finals), the floor tape of Miller's Blackhawks 1990 (when my sister and I marched together before she aged out) the floor tape of Anaheim Kingsmen 1991, the floor tape of State Street Review 1992, and the Prelims performance of State Street Review 1993, my age-out year. I was crazy-geeky-happy when I realized we'd be able to digitize so many of these color guard treasures that mean so much to me. I'll be working on converting over all the shows that she has put onto DVD for me so far, and eventually, we'll convert more VHS to DVD. Super Mom, converting memories to be saved and shared! !